Cedar Creek pours into a shallow basin at Cedar Falls’ upper tier before disappearing over its second tier and into the stony gorge beyond. Cedar Falls Trail, September 21, 2016. One of multiple “Cedar Falls” in Washington along various creeks and rivers of the same name, the North Cascades’ Cedar Falls descends into a deeply delved gorge hidden from sight just off an otherwise unremarkable stretch of the much longer trail that provides access to the distant Lake Chelan-Sawtooth Wilderness. The trail climbs gently through brushy woodland of mixed forest with occasional windows opening to glimpses of the surrounding peaks and ridges towering above. 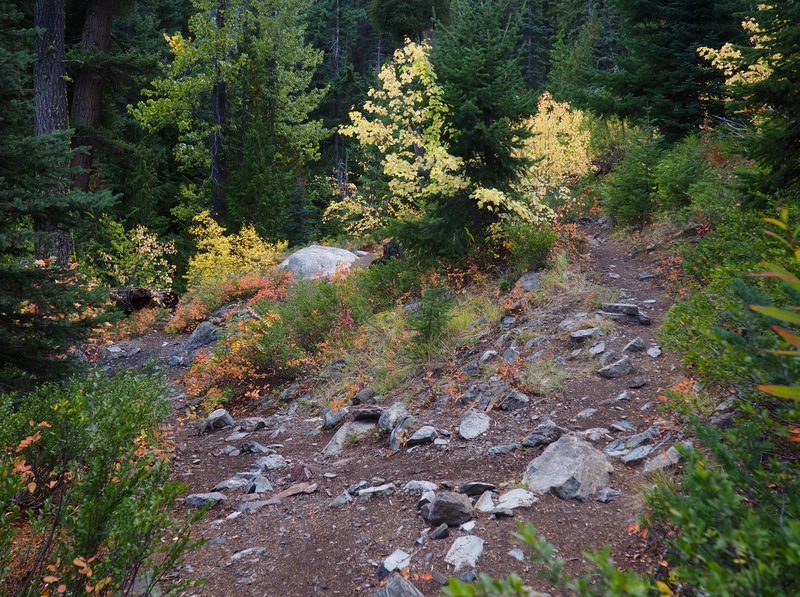 Autumn color is abundant throughout the forest under- and middlestory. Although audible along much of the trail, Cedar Creek remains unseen in its close-walled course below. 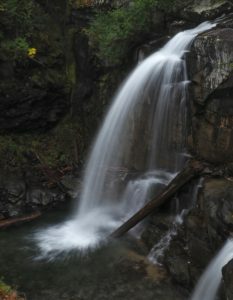 Easily bypassed, the falls’ unmarked viewpoint lies just off the trail and obscured by forest approximately 1.75 miles/2.80 km from the trailhead. Track your distance and, where the creek sounds especially close to the trail, look for a widening or fork to the left of the trail. Exercise great caution while exploring the falls, as mishaps could be disastrous. From its upper tier, the falls drops precipitously into a gorge unseen from the first vantage point. A short bootpath leads left to a cliffside view of the gorge and the falls’ second tier. 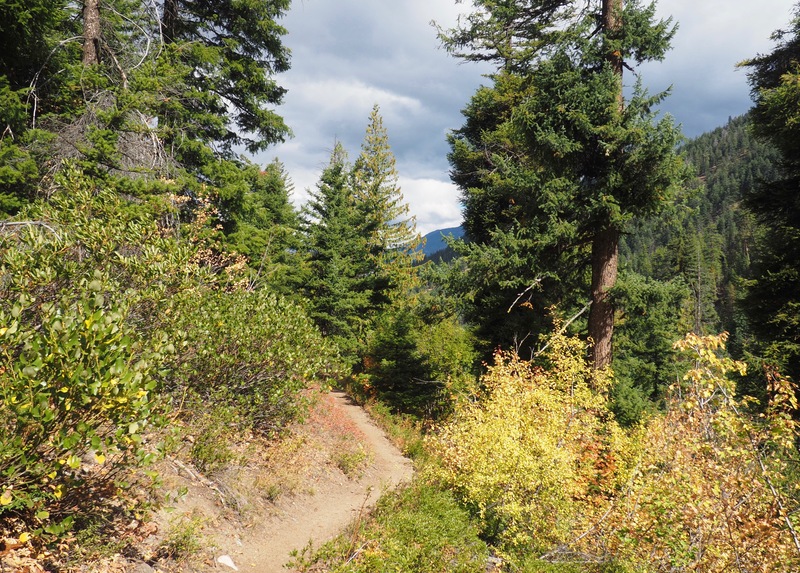 Given the trail’s location just off Highway 20 at the upper end of the Methow Valley, sounds of civilization are occasionally heard near the trailhead, but, as the trail wends deeper into the forest, they are replaced by the chattering of creek waters rushing down their steep-walled side valley. 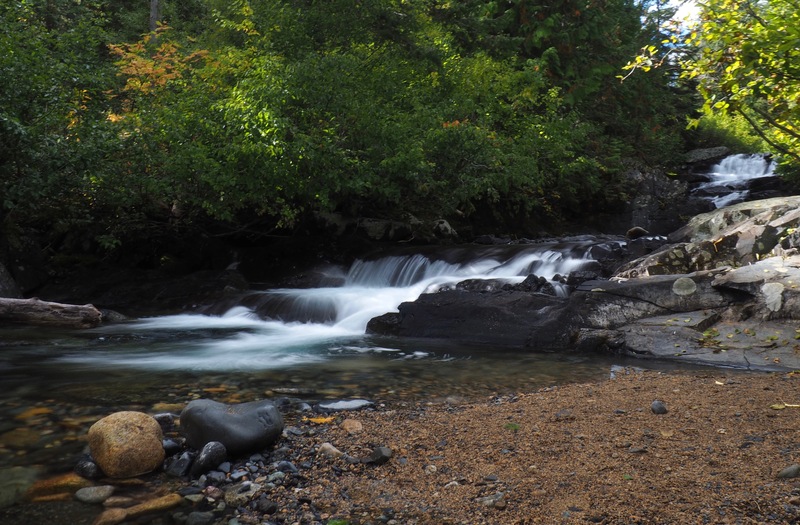 Although a popular hiking destination, it is still possible to have the trail and falls to oneself, especially on a less-frequented weekday. The trail passes through alternating forest and open brush. Cedar Falls Trail, September 21, 2016. Woodland clearings afford glimpses of the surrounding Cascade foothills. 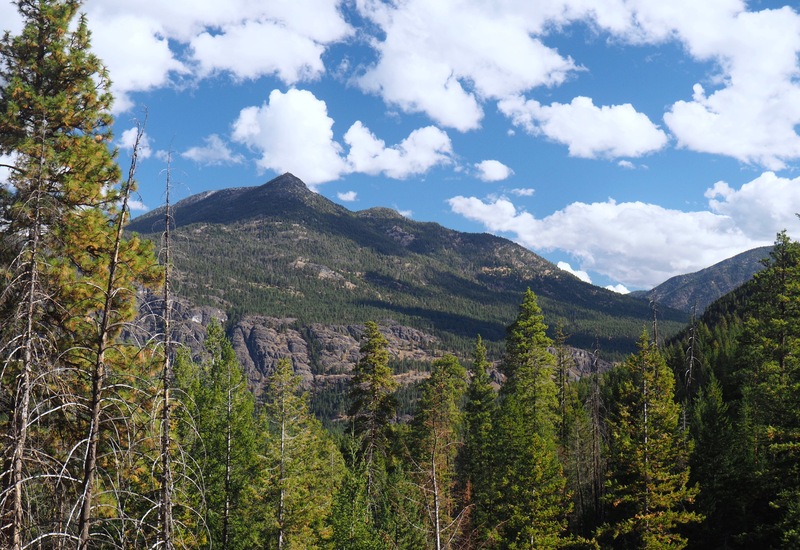 Here, Goat Peak dominates the view from near the trailhead. Cedar Falls Trail, September 21, 2016. 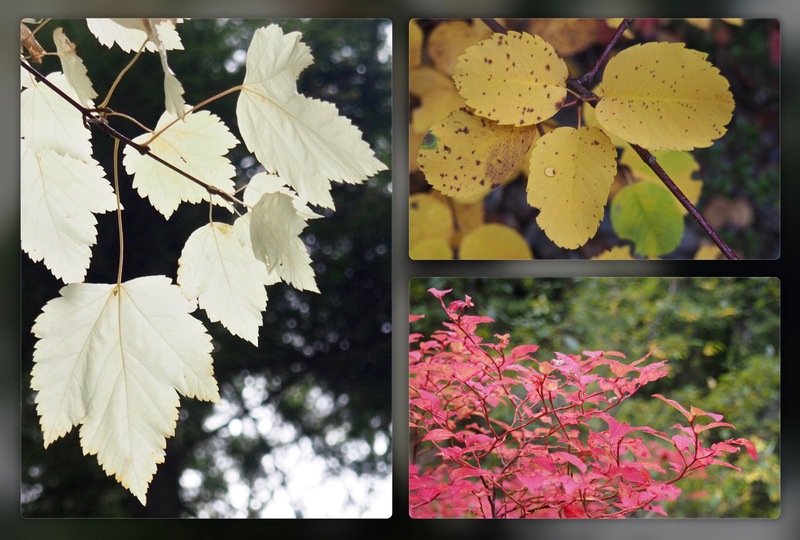 The trailside’s autumn palette ranges from the pallid translucence of Rocky Mountain maples (Acer glabrum), to the speckled gold of western serviceberries (Amelanchier alnifolia), to the molten scarlet of blueberries (Vaccinium sp.). Cedar Falls Trail, September 21, 2016. 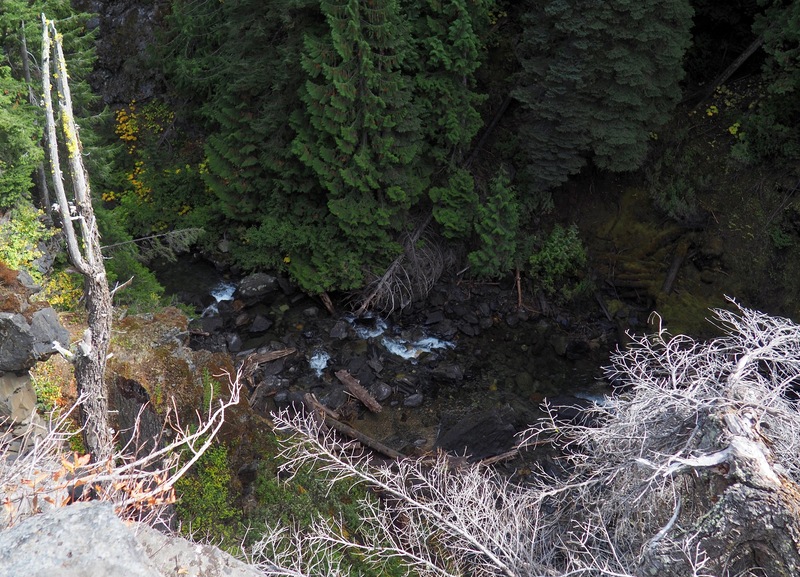 Access to the viewpoints above the falls is barely discernible as an unmarked clearing to the left of the main trail. Cedar Falls Trail, September 21, 2016. Exercise great care when approaching the falls, as the viewpoints skirt the brink of a sheer cliff that walls the creek below. Cedar Falls Trail, September 21, 2016. Cedar Creek approaches the falls from beyond sight by a series of shallow stairsteps. Cedar Falls Trail, September 21, 2016. 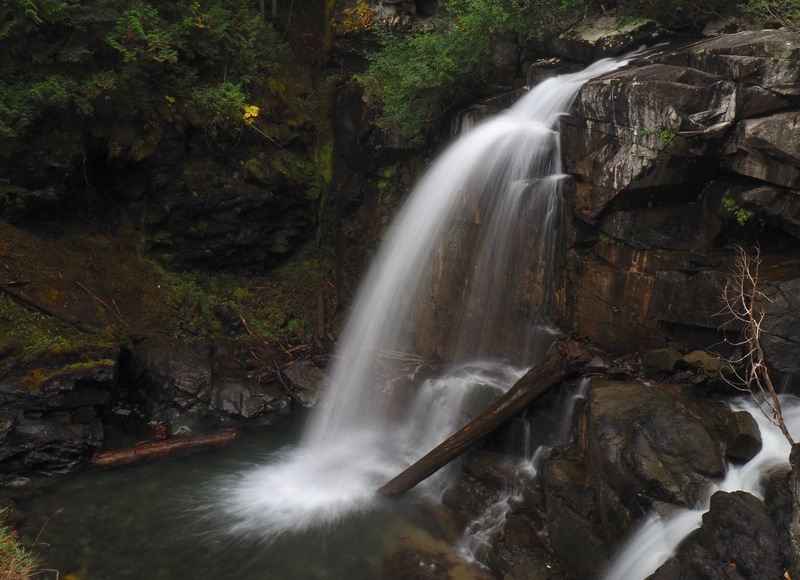 At its upper tier, Cedar Falls overshoots its ledge and pours 40 feet/12 meters into a shallow pool before quickly disappearing over its second tier that is unseen from this vantage. Cedar Falls Trail, September 21, 2016. A short bootpath leads left from the falls’ upper tier to a view of its 55-foot/16.7-meter descent over its second tier into the deeply hewn gorge below. 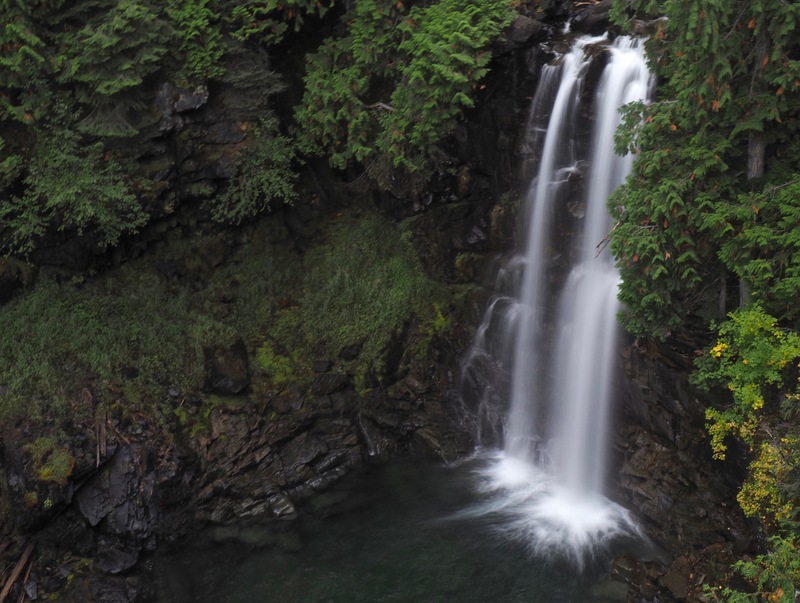 Cedar Falls is aptly named, as the ruffled foliage lining its waters is that of the western redcedar (Thuja plicata), a cypress named after true cedar for its similarly fragrant wood. Cedar Falls Trail, September 21, 2016.